Recently I’ve been trying out some of the solo instruments from new start-up Aria Sounds. I hope to have a video review of some of their series up on this blog soon – but meanwhile here is a piece I’ve created using the Solo French Horn whilst experiencing “a Bruckheimer moment”. I’ve been wanting to do an atmosphere ambient space-track for a while. I guess after butchering the Doctor Who theme (sorry about that everybody) – I was ready to make something original. This uses a number of libraries. I was keen to work in my most recent acquisition courtesy of VSTBuzz somehow. 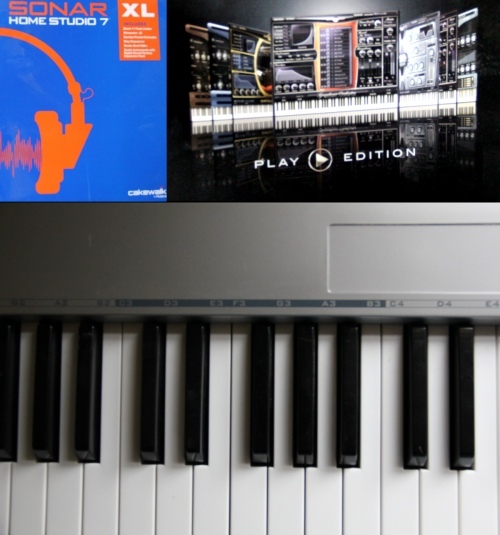 VSTBuzz do weekly deals offering VST instruments usually at half the price. I should mention at this point that I have not been offered any benefits or payment to endorse their site, I simply like it! Obviously deals vary and some appeal more than others. The latest deal (at the time of this blog post and the instrument library I was referring to) is the Tongue drum and Fujara Textures by Crypto Cipher. Quick summary about this library – it is rather nice and professional looking. It is particularly good for more mellow ambient tracks. The drum itself is great and there are about 16 other interesting pads to play with. The Tongue drum part of the package is well polished. The Fujara textures are basic but sound great – they can add some real exotic flavour to a track. Would I pay full-price for this? Being honest – probably not. However the 50% discount makes all the difference. Check it out before the deal ends early next week. Yesterday I planned to unwind after a long long day because goodness knows I need this right now! 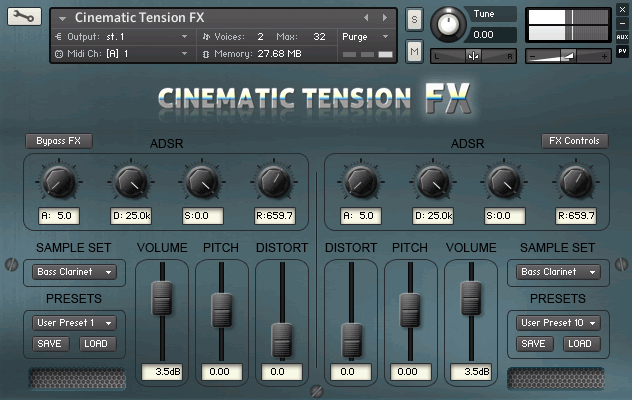 I decided as a special treat to purchase the rather lovely Cinematic Tension FX by Cacophony-inc from Sampleism before the price goes up at the end of this month. So I did. I won’t review it here but it’s a nifty little product which I recommend. I fired up my DAW (Cakewalk Sonar X1 Producer) with much excitement. I have a fully boxed retail copy, which has been working absolutely fine for the past six months. Only now I am being told I have a trial version which expires in 26 days! What!? So I dig out the box and enter the Registration code back in. That’ll fix it I thought. Only no go! So I dig online further and find I am experiencing the same as this, only I can’t resolve the issue. So the next stage is contacting their support. They give me exactly the same codes and say either I am entering the code incorrectly (what!?) or it isn’t registered (er it has been for 6 months prior to this). Anyway, I jump through the hoops “like a good boy” and follow all their advice hoping to get to the next “level” of support. No dice! Anyway I have just received an email where the person dealing with the support is offering absolutely nothing new except for now seemingly accusing me of having an unofficial or not-for-retail copy. To say I am fuming about this is perhaps an understatement. I’ve now spent over a day trying to sort this out. I’m still no closer to a satisfactory explanation let alone finding a solution for the ticking time-bomb (which ironically is what I’m now turning into)! I can only imagine the frustration a freelancer would feel if they had wasted a day chasing up after this. My relationship with Cakewalk Sonar hasn’t always been smooth – but I have been generally happy with this particular version with its 64bit support and drag/drop window approach – a huge improvement over my old buggy unstable copy of Sonar Home Studio 7 XL I had. But the support? Well, I really hope I can update with a more positive outcome soon, but if not – I will be shouting from the rooftops about Cakewalk and its support (they will also lose at least one genuine customer in the process). Ball in their court! Meanwhile I’m now going to have some tea and a cold shower to cool myself down and apologies for the rant post! Brass. Trombone. Tuba. Horns. The trumpet. The one sound which still eludes so many midi composers (and definitely myself). You can make strings sounds generally authentic, even woodwind can be replicated reasonably. Yet brass sounds just don’t translate – and there is just no beating the real thing. It is an art, a skill, a science and has a personality. I woke over the weekend to the sad news that one of these brilliant trumpet personalities is no long with us. Derek Watkins had the unique honour of playing in the orchestra for every single Bond film to date. Considering the wide range of composers involved and the fact the series started over 50 years ago – this is an astounding feat. If John Barry is the true ring-master for the Bond sound and Vic Flick is the man who helped define that twanging guitar, then Derek is the man who developed that bold brassy sound associated to the series. I appreciate what Derek brought to the table in Bond music terms, so this news hit me particularly hard. I also found out shortly afterwards that another important and inspiring Bond member, poster designer Mitchell Hooks (who designed the very first poster for Doctor No) has also recently passed. Again, an incredibly talented member who helped shape the success of the series from the very beginning. To end on a slightly lighter note, happy 67th birthday (Friday) to former Bond Timothy Dalton a happy 67th birthday! He was ahead of his time in terms of showing Bond as a flawed human and it can be argued his portrayal is closest in spirit to the original novels. It would have been interesting seeing him in a third movie (particularly as this seems to be the point where the actors hit their stride in the role). Had a feeling recently that I’ve not been composing enough and really wanting to get back into it! I was then shocked to discover that last year’s output consisted of only three tracks, two of which were experimental playing around (ie. Not that great and well under the minute mark). Eek! Therefore I’ve set myself a task of trying to compose at least one track a month (or at least 12 new tracks – one for each month). Already I’ve equalled last year’s output! For January I composed two demo variations for video for Culham Centre for Fusion Energy. They were unhappy with the original music used (can’t say I blame them, the track they used was non-stop, overbearing and it felt like the footage was being edited to the track rather than following its natural flow). Unfortunately the original video editors have shown no sign of providing us with an dialogue only audio track (!?). Hopefully this situation changes in the near future, if not I’ll release the track online at a later point. Meanwhile this one has to remain under-wraps! Oh the politics! February was the month where I did a short cue for my latest short film Etiquette (track name was Bumbling Trevor) at the 11th hour. To be honest, I much prefer it to the earlier cues linked above. Nothing fancy but certainly fits the film better than being a stand-alone track. Also composed a short piece for the Baby Oak logo, which probably took little more than about 5-10 minutes to compose. I class this as my style because I can’t help but ignore the similarity between this and a track I wrote almost 20 years ago (showing my age now!). Here is an excerpt – for comparison purposes. It was a track called “The Countdown” based on the ticking time-bomb device used in many a Bond film. Bear in mind in those days I was using very basic tools – namely a soundtracker program with 8 bit samples on an Amiga, no midi whatsoever! Obviously it can’t quite compare to a full-blown midi sample library, the tracks were not only limited by the number of channels available but also by the size (around 300k). Orchestral style tracks were quite rare back then, everyone seemed to be doing dance/rave numbers. I found it interesting anyway, so thought I’d share it – anyone else agree? The track was written over the evening of Monday/Tuesday. Therefore technically it’s really a February tune. However, well call it March because it’s only just being released. 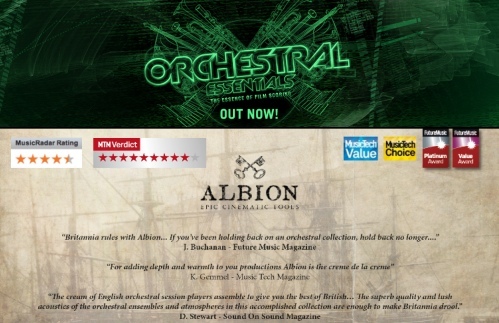 I’ve recently been upgrading some of my virtual instrument libraries with a few new additions (Albion and ProjectSAM Orchestral Essentials. I may well decided to do a comparison between the two of these for a later blog entry – should anyone show any interest (get in touch if you do). They are both playing to a similar market. I also decided to try the Sample Logic “Try Pack” for $5. Well worth the money should you have the full version of Native Instruments Kontakt 4 or 5 at your disposal! This was of course nothing to do with the 50% off Sample Logic deal that DV247 is available until March 11th! Oh no! 🙂 Hopefully you can be expecting a few more tracks from me soon. I will try to change my pace from my usual more “reflective” style for a bit. I will get plenty of chance to revisit this territory soon when my “happy families” duo (“Family Portrait” and “Dad”) hit later in the year. Meanwhile, to end on a somewhat cool musical note and being the Bond music fan I am – how much fun is this? No one will ever truly appreciate how much work goes into making a film except the actual filmmaker. A simple but rather depressing fact which filmmaker’s need to accept early on. You spend ages honing the script, storyboarding, working with actors, making creative decisions about the locations, costumes, shots, editing – half of which is only on-screen for a second, or in some cases not at all. Once the shoot is done – a handful of people think the final film is done and it just magically sprouts out of thin air (all snappily edited, colour corrected and sound mixed). If only! This blog is a form of therapy for me, hopefully I’ll sit down in years to come and remind myself how I spent hours agonising over the smallest details. These are details which most people will never notice or appreciate. They are vital for the story, but will cost an unbelievable amount of time, effort and energy to work through. To add insult to injury the audience will highlight a completely new range of issues (usually even larger) which have been over-looked. It can drive you insane thinking about it! Well, it appears I’m about to step through this whole cycle again with Etiquette, albeit thankfully on a much smaller scale than with Gardening and other crimes. This is really just an exercise in sharpening up and expanding my film-making skills which I haven’t really been using to great effect recently. I’ve just taken Dan Collier’s original script and adapted it. What I found interesting is how the original script differed from the final production. I actually happen to think some of the creative choices made during the shoot greatly benefited it. Therefore I’ve made the decision to keep things closer to the filmed version for now. I’ve also added a couple of small tweaks, I always like to have some additional input into the script no matter how small. Whether or not these changes work remain to be seen. Script thoughts/changes. The goal of this will be to remove anything which doesn’t work or isn’t needed and keep the production as simplistic as possible. Casting (there are seven characters in the script). We will need to fill these somehow. Crew members. Part of this is deciding how we will film the project and therefore what skills we need. Hopefully being a smaller production, the crew size will also be small but flexible. We need to find people to do these roles (eg. DoP, camera operators, lighting, sound recording, make-up, continuity, runners, catering etc). A list of equipment needed to make the film. Scheduling when we are planning to shoot (still in flux, part of this comes down to the availability of cast, crew. It might also come down to locations or equipment availability too). Locations. Most of the film can hopefully be handled in one location, moving a film-team around can eat up a surprising amount of time. I found this out the hard way on Gardening. The opening scene was set one house, but we ended up using four different locations for the various parts of the house (one for the front door/stairs, one for the bathroom (a scene we ultimately cut), one for the kitchen/bedroom and another for a kitchen scene). Logistically I’m very keen to avoid that this time around. Props list and where we plan to source them. This is also likely to cover the costumes which are required for the characters. Actor input will no doubt affect some of these decisions further down the line. 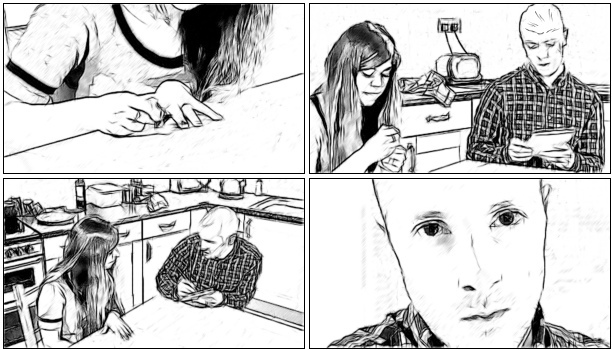 For the meeting I’m also in the process of creating some rough storyboards from Dan’s version to give Sherilee a visual idea of what we need to achieve. I suspect the final storyboards will end up being quite different, but this is a great starting point for now. To be honest making a film can be a lot like writing music: there are many elements which need to come together, in the correct tone, in some semblance of order at the right time with many potential creative paths which lead to completion. So what did I use to create the track? 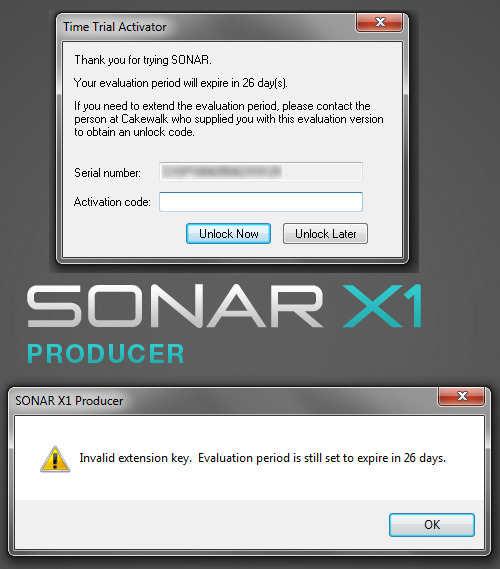 Firstly there is the sequencing/recording software itself for which I am using an older version of Cakewalk Sonar. I’ll be honest and say I don’t find this version the most intuitive package ever – but it does the job. The keyboard is a M-Audio keystation 88ES, for the price you can’t argue but it’s not exactly what you could call a compact (it takes out most of my room). For the sound library I’m using the East West Quantum Leap Complete Composers Collection set (in particular the Symphonic Orchestra Gold instruments, which is because I love orchestral scores). This library (which is to be fair awesome) is a complete monster and takes up over half my hard-drive. I now see it’s sold on a dedicated hard-drive which makes sense, it took me a whole day to install it from DVDs!). Now that I have my tools, all I need to do is write the tune! The first thing I try to do is establish the tone and character of the piece. This initially is in terms of the instruments I plan to use and it turns out to be one of the most time consuming/difficult parts of the process. I tend to have a lot of instruments at this stage whilst I experiment, but always add a piano for identifying melodies and chords. Once I have identified my orchestral palette, I start to colour in (which is the fun bit). Click on the links to hear how things build up to the final track! For Etiquette, I started with Pizzicato (plucked) strings, which had a snappy but almost comical urgency about them. The first thing composed was the low backing for the track which set a nice tone which I could form a melody over. I play everything in live on keyboard. This does tend to mean that the timing isn’t going to be 100% perfect, but it lends a human element which I really like. Pizzicato strings were a good start, but it didn’t feel like we were fully there yet. To finish the backing off I wanted to compliment these with the backing of a Tuba. For some reason I was always going to use a Tuba as I envisaged the Etiquette tune to have some oompa-loompa elements. I also wanted to experiment with the timings so that there was some sense of awkwardness timing-wise against the Pizzicato backing – which is in keeping with the main character. On its own the Tuba sounds rather awkward, but with the Pizzicato’s added in it, the tune still flows musically. So we now have our backing. So now comes the difficult part, coming up with a catchy melody. For this I used a Marimba. This kept melody playful, light and also seemed to give the piece a Thomas Newman American Beauty feel. When added together you can hear that the tune is more or less there now. Despite this fact something is missing, for this I added a harp. This is to give the tune an extra flutter of energy which it was otherwise lacking. The tune is now slightly more dynamic and the harp compliments the Pizzicato strings in particular. This is merely some cosmetic sprinkling on top. The alto-flute isn’t strictly necessary, but it gave the tune an extra human touch when doubled up with the marimba. Unlike the other instruments I had to get the emotion of the flute just right (if played flat it lacks depth and therefore feels artificial and lifeless). The final piece all together! Again, like post-production – this isn’t exactly where the process ends (even if my blog entry does). The piece will then need to mixing correctly into the final track.I won’t go through this process here, as it’s mostly a case of experimenting. I think that is enough from me for this time, but I’ll aim to keep you posted on how the production meeting goes next week.